For other uses, see Freebirds. 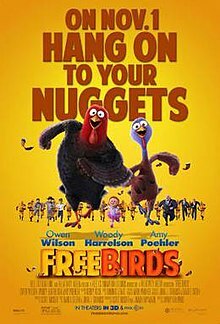 Free Birds is a 2013 American 3D computer-animated comedy film about two turkeys traveling back in time to prevent Thanksgiving. It was produced by Reel FX Creative Studios as its first theatrical fully animated feature film. Jimmy Hayward directed the film, which he also co-wrote with Scott Mosier, the film's producer. The film stars the voices of Owen Wilson, Woody Harrelson and Amy Poehler with supporting roles done by George Takei, Colm Meaney, Keith David, and Dan Fogler. Originally titled Turkeys, and scheduled for 2014, the film was released on November 1, 2013, by Relativity Media. The film received negative reviews from critics and earned $110 million on a $55 million budget. Reggie the turkey has always been afraid of Thanksgiving because turkeys have always been on the menu, but his attempts to warn his farm-based flock constantly fall on deaf ears and has made him an outcast. When the other turkeys finally realize what is going on, they thoughtlessly throw Reggie outside in an attempt to save themselves, instead of listening to his escape plan. In a surprise twist of fate, he winds up being named the "pardoned turkey" by the President of the United States and is subsequently taken to Camp David. Although initially hesitant, Reggie soon eases into a routine of doing nothing but enjoying pizza delivered to him by the "Pizza Dude" and watching Mexican telenovelas. He gets bag-kidnapped by Jake, a member of the Turkey Freedom Front who tells him that "The Great Turkey" told him to find Reggie and take him back to the first Thanksgiving with him to take turkeys off the menu once and for all. They then infiltrate the base where a time machine is located. Despite interference by federal officials and an attempt by Reggie to trick him back to the surface, Jake manages to commandeer an egg-shaped time machine with an A.I. software named S.T.E.V.E (Space Time Exploration Vehicle Envoy). Jake instructs S.T.E.V.E. to time-travel back to the same day in 1621, three days before the first Thanksgiving. Once there, they are ambushed by colonial hunters led by Myles Standish, but they are quickly rescued by native turkeys led by Chief Broadbeak and his two children, Ranger and Jenny. Broadbeak explains that the turkeys in the area have been forced underground since the settlers came and that they cannot risk fighting back without the settlers taking them. The next day, Broadbeak orders Jake with Ranger to spy on the settlers and Reggie with Jenny to spring all the hunting traps the humans set up. Despite initial hostility, Ranger and Jake find out that the settlers have already begun preparations for Thanksgiving and where they keep their weapons. Meanwhile, Jenny believes in Reggie for lying about being from the future and is impressed with his accidental unorthodox way of springing the traps. However, they are soon intercepted by Standish and Reggie is forced to get her in orbit over the planet aboard S.T.E.V.E., validating everything he said in the process. Reggie asks Jenny to go back to the future with him once everything blows over, but she refuses to leave the flock no matter how much she likes him. Jake then drags Reggie away and tells him he has a plan to attack the settlers. However, Reggie has gotten sick of all his improbable stories and threatens to leave. Desperate, Jake tells him that this trip was more about him making up for his failure to save turkey eggs while escaping a turkey-fattening facility when he was young, maintaining that the Great Turkey convinced him to go through with this. While still reluctant to believe what he said, Reggie still goes along with the plan. They manage to use gunpowder to destroy the weapons shack, but Jake inadvertently leaves a gunpowder trail back to the tree the turkeys are hiding under. Standish and his men flush the turkeys out from underground, capturing enough for the feast. Broadbeak sacrifices his life to get the remaining turkeys into the tide pool. Afterward, Reggie returns home, where he discovers from S.T.E.V.E. that he is the Great Turkey. Jenny is sworn in as the new chief and orders the remaining turkeys to prepare an attack on the settlers. Jenny, Jake and Ranger lead the turkeys in an attack on the settlement just as Chief Massasoit and his tribe of Indians arrive. Inspired, Reggie goes back in time to stop the attack, inadvertently trapping Standish in the time stream. Through S.T.E.V.E. and the Pizza Dude, Reggie convinces the settlers and the Indians that pizza is a more acceptable food than turkeys, taking them off the Thanksgiving menu entirely. Reggie stays with Jenny while Jake takes S.T.E.V.E. in order to look for new adventures. In the mid-credits, Jake returns moments after leaving Reggie and Jenny. With a chicken and duck in his wings, Jake starts to tell every turkey present about the turducken. Owen Wilson as Reggie, a domesticated turkey who is pardoned by the President of the United States and is dragged into Jake's plot. Woody Harrelson as Jake, a wild turkey and the president of the Turkey Freedom Front. Amy Poehler as Jenny "Jennifer", a wild turkey and Reggie's love interest. George Takei as S.T.E.V.E., the artificial intelligence of the time machine. Colm Meaney as Myles Standish, a pilgrim hunter. Keith David as Chief Broadbeak, the chief of the native wild turkeys, domesticated turkeys, and ocellated turkeys and Jenny's father. Dan Fogler as Governor William Bradford, the governor of the Plymouth colony. Robert Beltran as Chief Massasoit, the leader of the Wampanoags. Development on the film, originally titled Turkeys, began in June 2009 and physical production began in January 2011. John Kricfalusi was involved in early development, and posted the concepts he created for the film on his blog. Reel FX and Granat Entertainment launched in 2010 Bedrock Studios (later renamed to Reel FX Animation Studios) to produce sub-$35 million family-oriented projects. Ash Brannon was then set to direct the film, but in October 2012, when it was announced that Relativity Media would co-finance, co-produce, and distribute the film, Jimmy Hayward took over the directing position. Originally scheduled for November 14, 2014, the film was moved up by a year to November 1, 2013, due to the vacant slot left after the delay of DreamWorks Animation's Mr. Peabody & Sherman. In March 2013, the film was retitled to Free Birds. Free Birds received negative reviews from critics. The review aggregator website Rotten Tomatoes reported a 19% approval rating with an average rating of 4.2/10 based on 85 reviews. The site's consensus reads: "Technically proficient yet creatively moribund, Free Birds begs unfortunate comparisons with the dim-witted fowl that inspired it." Another review aggregator, Metacritic, which assigns a normalized rating out of 100 top reviews from mainstream critics, calculated a score of 38 based on 27 reviews, indicating "generally unfavorable reviews". Justin Chang of Variety gave the film a negative review, saying "This seemingly innocuous toon fantasy becomes another noxious-but-sanitized exercise in family-friendly cultural insensitivity." Alonso Duralde of The Wrap gave the film a negative review, saying "Even setting aside the film's disregard for time-travel paradoxes and genocide metaphors—trust me, you don't want to wade into either of those—Free Birds just isn't funny." Stephanie Zacharek of The Village Voice gave the film a negative review, saying "Like so many modern animated features, Free Birds packs too much in; the picture feels cramped and cluttered, and, despite its occasionally manic action, it moves as slowly as a fattened bird waddling toward its doom." Kate Erbland of Film.com gave the film a 7.6 out of 10, saying "Free Birds is a more than worthy (and weird) holiday diversion for the whole family." Stephan Lee of Entertainment Weekly gave the film a C, saying "Often, you can point to a middling animated film's visuals as its saving grace. But this colonial world, which should feel like an expansive autumnal panorama, feels oddly inert and two-dimensional." Claudia Puig of USA Today gave the film two and a half stars out of four, saying "The 3-D animated film, the first of the holiday entries, is likable and amusing, if slight." Chris Cabin of Slant Magazine gave the film one out of four stars, saying "The film is absent of humor and thrills, and accented with designs and color schemes that are equally notable for their lack of risk." Sheri Linden of the Los Angeles Times gave the film a negative review, saying "Like the ungainly avian creatures at the center of the herky-jerky adventure, this 'toon seldom gets off the ground." Jessica Herndon of the Associated Press gave the film two out of four stars, saying "A solid premiere effort that shows Reel FX's potential to produce quality full-length animation. But the story-line, with its hypothetical constituents, seems a little desperate at times, even for a kiddie film." Linda Barnard of the Toronto Star gave the film one out of four stars, calling the film "A seasonally pegged 3D cartoon bore that sets the bar so low, it could give a slug a concussion." Tom Russo of The Boston Globe gave the film two out of four stars, calling the film "A welcome foray into underexploited territory, conceptually at least." Bill Goodykoontz of The Arizona Republic gave the film two out of five stars, saying "It isn't cute. It isn't really funny. It just kind of is." Louis Black of The Austin Chronicle gave the film one and a half stars out of five, saying "Free Birds falls flat, despite its good intentions, ideological cuteness, humorous polish, and skillful computer animation. The fine voice talents of the almost-ideal cast are wasted." Elizabeth Weitzman of the New York Daily News gave the film two out of five stars, saying "Most minor animated movies are so rote that it’s worth acknowledging a strange bird like this cheerfully gonzo kid flick. It’s no masterpiece, but if you’re hoping for a family film that will keep everyone reasonably entertained, this will fly." Miriam Bale of The New York Times gave the film a negative review, saying "The concept is inane, and the execution is manic and unoriginal." Sara Stewart of the New York Post gave the film one and a half stars out of four, saying "Is Hollywood scheming to turn your little ones into strident vegetarians? Could be, but I wish they’d do it with material more inspired than Free Birds, a forgettable—and occasionally borderline offensive—animated tale of turkeys trying to take back Thanksgiving." David Hiltbrand of The Philadelphia Inquirer gave the film one and a half stars out of four, saying "Free Birds is a stale turkey hash that heaves a lot of ingredients in the oven but never turns on the gas, a frantic attempt to come up with an animated film built around Thanksgiving Day traditions." Liam Lacey of The Globe and Mail gave the film one and a half stars out of four, saying "The movie's animal rights, vegetarian message should go down easily with politically correct parents—at least until they choke on the offensive depiction of 17th-century turkeys as face-painted, headband-wearing native Americans." Stephanie Merry of The Washington Post gave the film two and a half stars out of four, saying "Finally, there's a movie vegetarian parents can enjoy with their impressionable offspring." Peter Hartlaub of the San Francisco Chronicle gave the film one out of four stars, saying "In execution, the film is all sidekicks and sight gags, with little story cohesion or purpose." Bill Zwecker of the Chicago Sun-Times gave the film a mixed review, saying "No, Free Birds is not (sorry) a turkey of a film. But it doesn’t really soar terribly high either. I only wish the quality of the writing in the earlier parts of the movie had been maintained throughout. If that had been the case, Reggie, Jake and their fellow turkeys just might have been flying high with the eagles—our official national birds." Michael Rechtshaffen of The Hollywood Reporter gave the film a mixed review, saying "Although it seldom approaches the inspiration of its plucky premise—a pair of turkeys travel back in a time machine to the first Thanksgiving in a bid to scratch the traditional entree off the menu—Free Birds nevertheless manages to avoid being branded a holiday turkey." Christy Lemire of RogerEbert.com gave the film one and a half stars out of four, saying "Everything about Free Birds feels perfunctory, from its generic title and holiday setting to its starry voice cast and undistinguished use of 3-D."
Free Birds grossed $55,750,480 in North America, and $54,400,000 in other countries, for a worldwide total of $110,150,480. In North America, the film opened to number four in its first weekend, with $15,805,237, behind Ender's Game, Jackass Presents: Bad Grandpa and Last Vegas. In its second weekend, the film moved up to number three, grossing an additional $11,112,063. In its third weekend, the film dropped to number four, grossing $8,106,151. In its fourth weekend, the film dropped to number five, grossing $5,363,208. Free Birds was released on DVD and Blu-ray on February 4, 2014 by 20th Century Fox Home Entertainment. As of March 20, 2019, the film rights to Free Birds are now owned by Disney through 20th Century Fox, which had obtained the home media rights since its release. The film's score was composed by Dominic Lewis. The soundtrack was released by Relativity Music Group on October 29, 2013. All music composed by Dominic Lewis, except as noted. ^ a b c Abrams, Rachel (October 24, 2012). "Relativity, Reel FX team on 'Turkeys' toon". Variety. Retrieved November 16, 2012. ^ "Dominic Lewis to Score 'Free Birds'". Film Music Reporter. April 20, 2013. Retrieved April 22, 2013. ^ "Free Birds (3D)". British Board of Film Classification. Retrieved October 30, 2013. ^ a b c "Free Birds (2013)". Box Office Mojo. Retrieved March 22, 2014. ^ a b c d e f g h i j k Shaw, Lucas (February 22, 2013). "Relativity Moves 'Turkeys' Up a Year; Amy Poehler Joins Voice Cast (Exclusive)". The Wrap. Retrieved February 23, 2013. ^ a b Rebecca, Murray (March 27, 2013). "Turkeys is Now Free Birds". About.com. Retrieved March 27, 2013. ^ a b Sperling, Nicole (March 17, 2010). "Owen Wilson and Woody Harrelson pair up for kid-flick 'Turkeys'". Entertainment Weekly. Retrieved February 23, 2013. ^ a b Rechtshaffen, Michael (October 29, 2013). "Free Birds: Film Review". The Hollywood Reporter. Retrieved November 4, 2013. ^ a b Mandell, Andrea (June 4, 2013). "Time-traveling turkeys take on Thanksgiving in 'Free Birds'". USA Today. Retrieved June 5, 2013. ^ Eisenberg, Eric (November 16, 2013). "Turkeys Gets An Official Release Date As Safe Haven Shifts To Valentine's Day". Cinema Blend. Retrieved March 1, 2013. ^ McNary, Dave (August 9, 2013). "Carlos Alazraqui Replaces 'Piolin' In Animated 'Free Birds' (EXCLUSIVE)". Variety. Retrieved August 16, 2013. ^ a b Chitwood, Adam (June 5, 2013). "First Images from FREE BIRDS; Additional Voice Cast Announced". Collider.com. Retrieved June 6, 2013. ^ Fleming, Mike (June 12, 2013). "Lakers Star Dwight Howard Joins Relativity/Reel FX Pic 'Free Birds'". Deadline. Retrieved June 13, 2013. ^ Kricfalusi, John (October 12, 2013). "Free Birds AKA Time Turkeys". Retrieved November 4, 2013. ^ Kricfalusi, John (October 31, 2013). "Turkey Action". Retrieved November 4, 2013. ^ Armstron, Josh (August 7, 2013). "Free Birds creators explain why Reel FX's first theatrical feature is no turkey". Animated Views. Retrieved October 27, 2013. ^ a b Fleming, Mike (March 17, 2010). "Granat/Jones Start Family Friendly Bedrock". Deadline. Retrieved February 25, 2013. ^ McNary, Dave (November 15, 2012). "Relativity, Reel FX set date for 'Turkeys'". Variety. Retrieved November 16, 2012. ^ a b "Free Birds". Rotten Tomatoes. Retrieved January 5, 2018. ^ "Free Birds Reviews". Metacritic. Retrieved November 10, 2013. ^ Chang, Justin (October 23, 2013). "'Free Birds' Review: Turkeys Meet 'Terminator'". Variety. Retrieved November 1, 2013. ^ Duralde, Alonso. "'Free Birds' Review: This Animated Thanksgiving Comedy Is Pure Gobble-dygook". TheWrap. Retrieved November 1, 2013. ^ Stephanie Zacharek. "Manic and Cramped, Free Birds Tries to Offer a Vision of a Kinder, Gentler Thanksgiving – Page 1 – Movies – New York". Village Voice. Retrieved November 1, 2013. ^ Kate Erbland. "Review: 'Free Birds'". Film.com. Retrieved November 1, 2013. ^ Stephan Lee on. "Free Birds Movie Review | Movie Reviews and News". EW.com. Retrieved November 1, 2013. ^ "Free Birds | Film Review". Slant Magazine. October 31, 2013. Retrieved November 4, 2013. ^ Linden, Sheri (October 31, 2013). "Review: 'Free Birds' lays an egg". latimes.com. Retrieved November 1, 2013. ^ Herndon, Jessica. "Review: Kooky 'Free Birds' fun, but flat – Movies". Boston.com. Archived from the original on November 3, 2013. Retrieved November 1, 2013. ^ November 1, 2013 1:12 AM EDT Facebook Twitter RSS (October 31, 2013). "Free Birds, a turkey of a movie: review | Toronto Star". Thestar.com. Retrieved November 1, 2013. ^ Russo, Tome (October 31, 2013). "'Free Birds' offers an animated Thanksgiving". The Boston Globe. Archived from the original on November 13, 2015. Retrieved August 17, 2016. ^ "'Free Birds,' 2 stars". The Arizona Republic. January 12, 2014. Retrieved January 17, 2014. ^ "Free Birds – Film Calendar". The Austin Chronicle. Retrieved November 4, 2013. ^ "'Free Birds,' movie review". New York: NY Daily News. Retrieved November 1, 2013. ^ Bale, Miriam (January 12, 2014). "'Free Birds,' With Voices of Woody Harrelson and Owen Wilson". The New York Times. Retrieved January 17, 2014. ^ Stewart, Sara (October 23, 2013). "Fumbling 'Free Birds' may make your kid a vegetarian | New York Post". Nypost.com. Retrieved November 1, 2013. ^ David Hiltbrand; Inquirer TV Critic (October 22, 2012). "'Free Birds': A gobble wobble". Philly.com. Retrieved November 3, 2013. ^ Liam Lacey (November 1, 2013). "Free birds: This undercooked effort leaves bad taste". Toronto: The Globe and Mail. Retrieved November 3, 2013. ^ Stephanie Merry (October 31, 2013). "Owen Wilson, Amy Poehler give voice to Thanksgiving-themed 'Free Birds'". The Washington Post. Retrieved November 1, 2013. ^ Peter Hartlaub (October 16, 2013). "'Free Birds' review: What cheesy product placement". SFGate. Retrieved November 1, 2013. ^ "'Free Birds': Turkeys nicely animated, but the story's undercooked – Chicago Sun-Times". Suntimes.com. October 31, 2013. Retrieved November 4, 2013. ^ Wloszczyna, Susan (October 30, 2013). "Free Birds Movie Review & Film Summary (2013)". Roger Ebert. Retrieved November 4, 2013. ^ "Weekend Box Office Results for November 1–3, 2013". Box Office Mojo. Retrieved November 10, 2013. ^ "Weekend Box Office Results for November 8–10, 2013". Box Office Mojo. Retrieved November 13, 2013. ^ "Weekend Box Office Results for November 15-17, 2013". Box Office Mojo. Retrieved January 16, 2014. ^ "Weekend Box Office Results for November 22-24, 2013". Box Office Mojo. Retrieved January 16, 2014. ^ "Free Birds Blu-ray". Blu-ray.com. Retrieved December 13, 2013. ^ "'Free Birds' Soundtrack Details". Film Music Reporter. Retrieved October 22, 2013. Wikimedia Commons has media related to Free Birds. This page was last edited on 20 April 2019, at 11:03 (UTC).